Everyone in our profession sings the praises of having a planned date night, even me! In fact, the Huffington Post just published an article on the importance of Date Nights. So we know that it is important, but at times it can seem like a daunting task: get a babysitter, make the plans, buy the tickets or make reservations somewhere, get out of your pjs when it might be more comfortable and easy to just sit on the couch and watch reality TV. 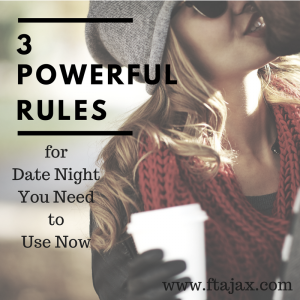 Here are three rules for date night, designed to encourage you to follow through with date night, and give you some tools to help make date night easier and more connecting with your spouse. Make sure that the time you are choosing to spend together is prioritized and protected. Mark the night off in your calendars and protect it just as much as you would an important business meeting or your child’s soccer tournament. Planning date night doesn’t have to be a chore. Talk through it with your spouse and decide what you both enjoy doing. Create a running list of ideas or take turns choosing an activity. My husband and I decided to write out a bunch of date night ideas, throw them into a hat and pick one each week to have “surprise” plans! For fancier dates, we get dressed and ready for these nights in different rooms in our home. This creates opportunities for “first looks” and leaves room for sweet compliments and romance. These are just a couple ideas that we use to keep date night spontaneous, fun and exciting. In order to connect with your mate, it is important that you disconnect from everything else. Yes, put the phones away, hire a baby-sitter (if needed), and plan activities where you can focus on each other. It is important to have time to connect with the whole family and friends, but date night should be just the two of you. Whether this is a lunch in the middle of the week or an every Friday night event, make sure you take the steps to put the focus on your spouse. If you have small children and are worried about emergency calls, then by all means keep your phone with you, but otherwise silence the phone and keep it put away. Shut down Facebook and other social media apps, so that a quick check of your phone to make sure your kids are okay doesn’t turn into 10-minute social media browsing. As for my husband and I, we decided to go one step further and plan dates that had no technology components to them. We put our phones away and get back to all the fun things that lend themselves to connection; dinner and dancing, putt-putt golf, long walk in the woods or on the beach, etc. As a result, we are more focused on one another and are more connected. Protect date nights from potential conflict or tense subjects. Date night is not the time to crunch the numbers for the household budget or try to figure out how you are going parent your children. This is a time to reconnect, get to know each other again, and maintain your friendship. Talk about your hopes and dreams, what inspires you, what you love about each other, your favorite things or what makes each other happy. Discuss vacation ideas, retirement dreams, or a recent hobby that you’re enjoying. Couples often get stuck in “report talk,” which is telling each other about the mundane tasks of living and the “business” of marriage and family life. The idea behind date night is that we have “rapport talk,” which is really getting to know each other and connecting on an emotional level. Plan regular date nights with your spouse to reconnect. This will look different for every couple so make sure you find what works for you. Add it to your calendars and fall in love with your spouse all over again. Do you struggle to find time with your mate? Do you feel like you and your spouse are growing apart? We are here to help guide you to a more connected, committed, and intimate relationship.